In a season that saw young Colombian Davinson Sanchez guide Peter Bosz’s defence to the second spot of the Eredivisie log and Europa League silver medal, the 20-year old by all standards have had it good. Honesty commands the admission that prior to Stockholm’s final very few knew anything about the young man. It’s so much so that the news of Lionel Messi recommending that Barcelona should do everything within their power to sign the youngster must have evaded our consciousness. You can’t really blame anyone for failing to recall an obscure name that came with an article carrying that of the Argentine. With nagging discussions and debate whether Arsenal star Alexis Sanchez would stay past the end of this season, Arsene Wenger has opened up on why he let Robin van Persie leave. RVP joined rival side Manchester United in the summer of 2012 with former United coach Sir Alex Ferguson receiving him with open arms. Fans are angry that Sanchez might exit the club the same way RVP did, as with other stars in recent years. Rival sides are keen on getting Sanchez. He has been linked with a move to Chelsea, Manchester City while reports claim Wenger would favour a move outside England to sides like Bayern Munich who are rumoured to be interested in the player. Clarence Seedorf has been sacked by Shenzhen FC after his failure to guide the football club to promotion and replaced him with Lazio boss Sven-Goran Eriksson. Seedorf was just appointed by the Chinese club in the summer but could only achieve a ninth-place finish in China’s second tier. This is Seedorf’s second dismissal in his managerial career, having also been dismissed by Milan at the end of the 2013/2014 campaign. Taking over from the Milan legend and former Netherlands midfielder is Sven-Goran Eriksson, who was just recently dismissed by Chinese top flight outfit Shanghai SIPG. Eriksson guided Lazio to the Scudetto in 2000 and has also managed Fiorentina and Roma in the Serie A during his managerial career. The club released a statement thanking Seedorf and his coaching team for their devotion. 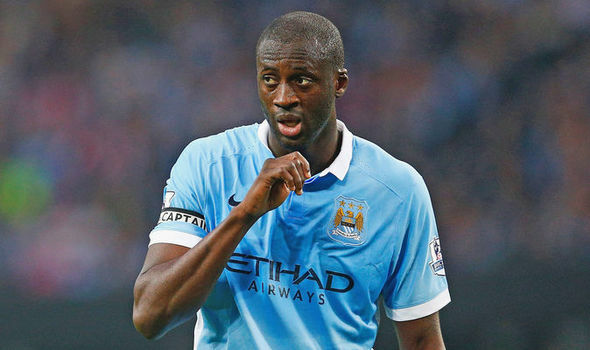 YayaToure has been left out of the Manchester City squad set to participate in the UEFA Champions League group stages this season. The move infuriated his agent Dimitri Seluk, yet he claims that the Ivory Coast international insists on forcing his way back to the squad. “If he wins the Champions League for City this season, then I will travel to England and I will say on television that Pep Guardiola is the best manager in the world,” Seluk started out, speaking with reps of Sunday Mirror Sport. “But if City don’t win the Champions League then I hope that Pep has got the balls to say that he was wrong to humiliate a great player like Yaya,” he posited. Former AC Milan manager Massimiliano Allegri has claimed that the rumours about a fallout with Andrea Pirlo were never true. Allegri has entered into the history books as the last AC Milan manager to have led the club to a league title. Going by the current downturn faced by the club, it looks like the feat may not be achieved in a long time from now. After being sacked by Milan, Allegri quickly found himself taken under the wings by Juventus who already had a very successful team. Much of this success was created by the magician Pirlo in the centre of midfield. Louis van Gaal used to be the head coach of Barcelona from 1997 until 200 and during this period of time, the Dutch manager was able to lift successive La Liga titles as well as win the UEFA Super Cup and the Kings Cup. Clarence Seedorf worked alongside Louis van Gaal back when they were in Ajax in in the 1990’s and the retired Dutch midfielder voiced his opinion in relation to van Gaal and his coaching time with the Spanish club. Seedorf believes that van Gaal did not receive the credit he deserved back when he was in charge of Barcelona. ‘’For sure he is a coach who knows how to pass on his philosophy to his teams. And I think what you have seen that with the Ajax spirit when I played there and that’s Van Gaal.Instead of buying many players you can always fill your first team with your own players who know the club culture, who know the club tactics and have lived for so long that everything for them is natural.He is a great coach and his record speaks for itself.’’ Former Ac.Milan player, Clarence Seedorf said.